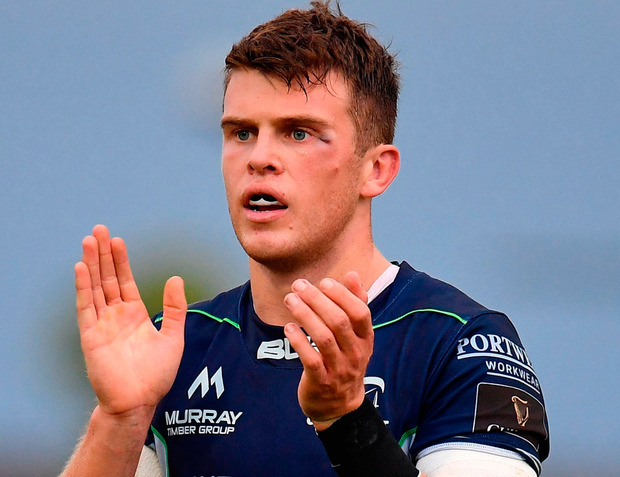 Fresh from training with Joe Schmidt's Ireland for the first time, Tom Farrell is keen to continue his rise through the ranks by helping Connacht to victory in South Africa tomorrow. Farrell was drafted in to assist in Ireland's preparation to face New Zealand and he says that invite has given him the encouragement to continue in the same vein for Andy Friend's side. The stats point to Farrell being Ireland's top centre in the PRO14 for defenders beaten (21), offloads (14) and tries scored (2) and he says he was thrilled to get the chance to show Schmidt his talents. "It was brilliant. It was only training and I wasn't going to be involved in any of the match-day squads, but it was great to be there or thereabouts. Just to be in the environment was great," said 25-year-old Farrell. "You're not given any playbook, you are thrown in there and you have to sink or swim. You have to be proactive, find the information and sit lads down. I was only in for a couple of days so I didn't have time to sit down and be quiet, so I had to be go after boys and get up to speed. "I was delighted to get called down. Whether a cap comes in the near future I don't know, but it gives me the motivation to keep going." Farrell is paired with Kyle Godwin in the centre for their game in Port Elizabeth, while Matt Healy returns to the left wing following his recent injury problems. Captain Jarrad Butler is named at No 8 while there is also a place for prop Dominic Robertson-McCoy on the bench after completing his six-week ban for stamping on Josh van der Flier. Southern Kings - M Banda; M Makase, H Klaasen, B Klaasen, Y Penxe; M Du Toit, S Ungerer; L Mguca, A Van Rooyen, N Oosthuizen; S Greeff, JC Astle (c); CJ Velleman, J Van Vuuren, R Lerm. Reps: T Balekile, A Tshakweni, L Pupuma, A Van Schalkwyk, M Burger, G Masimla, N Dukisa, T Kruger. Connacht - T O'Halloran; C Kelleher, K Godwin, T Farrell, M Healy; J Carty, C Blade; D Buckley, S Delahunt, C Carey; U Dillane, J Cannon; S O'Brien, C Fainga'a, J Butler (c). Reps: T McCartney, P McCabe, D Robertson McCoy, G Thornbury, P Boyle, J Mitchell, D Horwitz, D Leader.